NILES, OH - Mahoning Valley Scrappers' single game tickets are on sale now. Tickets are available at the Chevy All Stars Box Office at Eastwood Field, online at mvscrappers.com or by calling (330) 505-0000. Single game ticket prices range from $8 to $13. New for the 2019 season is Ticket Assurance. When you purchase a Scrappers ticket with Ticket Assurance you are purchasing a transferable ticket. Ticket Assurance is available for an additional $2 per ticket for any individual game ticket. Assurance tickets are eligible for a one-time transfer to another date, prior to or after the originally purchased game date, provided the ticket has not yet been used. Scrappers tickets and ticket assurance must be purchased as one transaction and cannot be purchased at a later date. Opening Day at Eastwood Field is Sunday, June 16 at 6:35pm against the Batavia Muckdogs. The home opener will feature a post-game fireworks show presented by 21 WFMJ & WBCB. Fireworks courtesy of Phantom Fireworks. Advance ticket purchase is encouraged. A special Opening Day Ticket Package is now available that includes four upper box seat tickets, a $20 gift card to Quaker Steak & Lube and a $10 gift card to Hot Head Burritos, all for the low price of only $44 (value of $70). 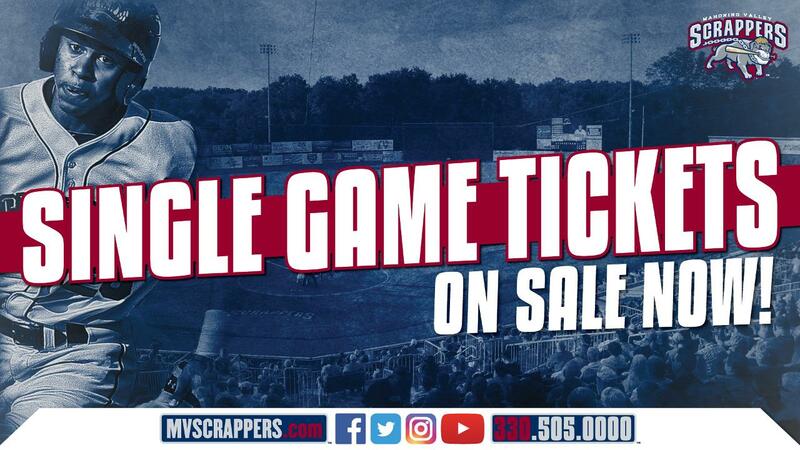 For more information about Scrapppers' single game tickets, ticket packages or group outings visit mvscrappers.com or call the front office at (330) 505-0000.